Engaging, informative, provocative–TED talks are the perfect tool for the English language arts classroom. In my AP Lang & Comp class, they are a refreshing source of high-quality rhetoric for analysis. Set a purpose for viewing. Students must always write something down in preparation for discussion or writing afterward. Review key elements for observation: non verbal and verbal cues, props, physical appearance, the words themselves. Preview any key vocabulary or historical context that students might need to make sense of the talk. Turn on the subtitles in English. How do bullies impact our society? Do bullies exist in the adult world? Can a bully ever be good for society? What is the opposite of cruelty? What does the speaker seem to assume about us as his audience? What is his purpose? Evaluate: is this TED talk powerful, persuasive, or beautiful? What rhetorical techniques does the speaker use, and what are their effects? What personal connections can you make to this piece? What about the speaker’s style allows you to make those connections? I wish I could have added…to the discussion. We typically go through this process every few weeks, depending on the year and the class. One year, I even did this EVERY Friday! I chose the first few, and students then nominated their favorite talks for the whole class to view and discuss. 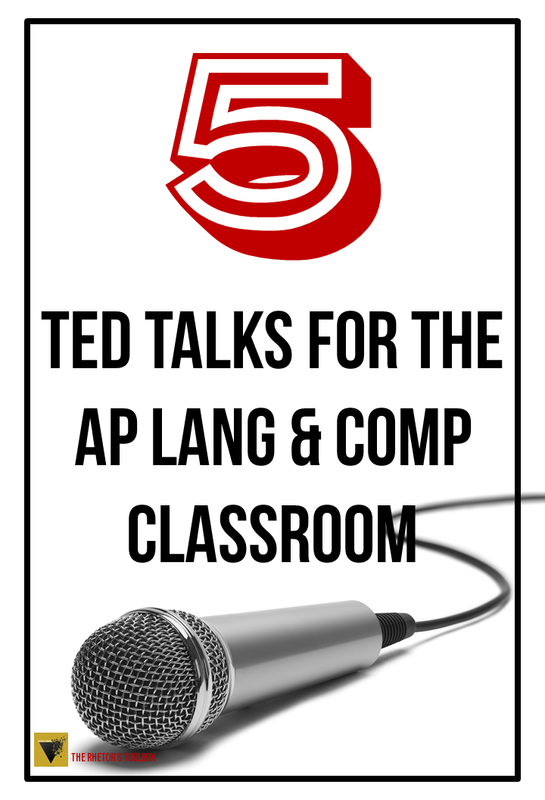 Here are five TED talks that I have used successfully with AP Lang & Comp students. Amy Cuddy, Your Body Language May Shape Who You Are I first saw this talk at an instructional coaching workshop. Many of my students watch now watch it on their own to prepare for tests, interviews, and school events. I even see them standing at their desks before a test, practicing their “power stance.” It’s a fun talk to show at the beginning of the year, or whenever your students need a little confidence boost. Chimamanda Ngozi Adichi, The Danger of a Single Story This talk is a beautiful reminder that we cannot allow ourselves to believe a single perspective on something we have not experienced for ourselves. David Rothkopf, How Fear Drives American Politics While this talk was given in 2015, it speaks to students today. It’s a perfect talk to pair with an FRQ related to public policy and politics. Shane Koyczan, To This Day…for the bullied and beautiful Even if it doesn’t fit directly with what we’re doing, I find a way to put this in front of students every year. This is a spoken word poem, animated and accompanied by violin. Students connect deeply with the messages around bullying and finding inner peace. Donald Hoffman, Do We See Reality As It Is? Students left the room saying their brains hurt after this one. Warning: it will spur discussions of existentialism and the purpose of life! Pause frequently to discuss. What are your favorite TED talks to use in the classroom? I love those. I just showed mine Bryan Stevenson’s We Need to Talk About an Injustice (https://www.ted.com/talks/bryan_stevenson_we_need_to_talk_about_an_injustice/up-next) today. Fabulous and thought-provoking. I also shared an infographic with them about education vs incarceration (before the TED talk) and that really primed the pump. Oooh, I love that one. I like the idea of pairing infographics.